Chairman of Guru Nanak Nishkam Sewak Jatha (GNNSJ) and the Nishkam Centre, Bhai Sahib Mohinder Singh was one of the many distinguished guests invited to a prestigious event at the Birmingham Buddhist Peace Pagoda. The event was to mark the launch of a Buddhist Academy, the 15th Anniversary of the Peace Pagoda and a Waso Robe Offering. Bhai Sahib was accompanied by Sewa Singh Mandla and Amrick Singh, Trustee of the Nishkam Centre and Centre Director respectively. The visit strengthened the on-going forging of relationships and demonstrated solidarity amongst the faith communities of Birmingham. The Peace Pagoda which opened in 1998 stands proud in a residential neighbourhood where its grounds are peaceful and tranquil. Sayadaw Dr. Rewata Dhamma was Founder and Spiritual Director of the Birmingham Buddhist Vihara and Dhammatalaka Peace Pagoda. He passed away peacefully in 2004 and it is firmly believed that without him the Birmingham Buddhist Vihara and Dhammatalaka Peace Pagoda could not have been established. On arrival the congregation warmly welcomed the Sikh guests and the program continued with an inspiring address by the Ven Dr Uttara Nyana. He spoke at length of how Buddha inspired love for all. He then led the chanting of prayers which was most uplifting and calming. Bhai Sahib was honoured to be invited to the auspicious event and said, “There is some fantastic work going on here. The academy is much needed and any attempt to improve educational attainment is most welcome. We must work together as people of faith to ensure the wellbeing and success of all. We must impart values in all that we think and do, which is why we created the Nishkam Schools to impart values to children”. Ven. Dr W Kassapa then spoke to the gathered guests about the great work the Pagoda was doing and went out of his way to thank John Beard, Chair of Birmingham Buddhist Vihara for all his hard work to sustain the centre. He then commented on the frightening matter of security of sacred places, “We must ensure that extremist thugs do not cause damage to our places of worship. It is important that we are guarded against such people. Unlike some traditions that may advocate fighting fire with fire, we are compelled to love all and show anger to none”. John Beard shared his heartfelt elation on Bhai Sahib’s presence at the event and commented, ”Both the Ven Dr Uttara Nyana and I were deeply honoured that Bhai Sahib Mohinder Singh, Sewa Singh Mandla and Amrick Singh, took time out of their very busy schedules to attend our event. 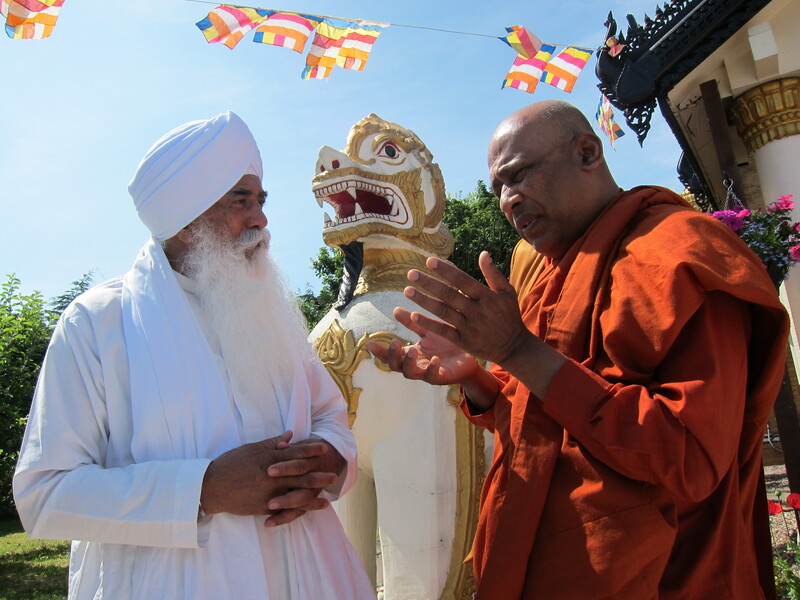 It was a great personal pleasure for me to have Bhai Sahib Ji, recognise our work at the Peace Pagoda as I consider Bhai Sahib Ji one of the major forces in the protection of faiths and community cohesion that I have ever met”. Before departing the Pagoda Bhai Sahib thanked John Beard for organising and inviting him to mark a great landmark event. 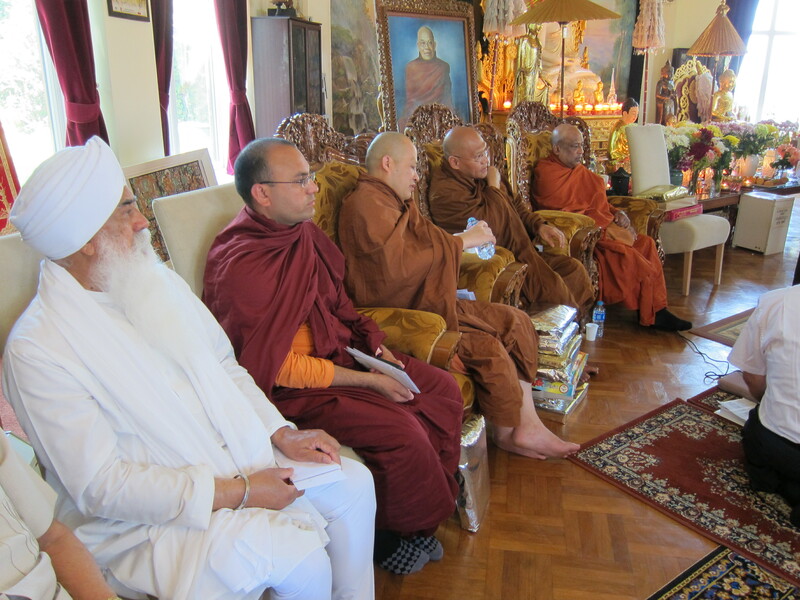 He also met with Ven Kassapa and discussed the sanctity of sacred places of worship and the need to respect and preserve each other’s places of worship. Bhai Sahib is working tirelessly to get the sanctity of all faith shrines protected and also to strengthen solidarity of faith communities. Chaired by Bhai Sahib Dr Mohinder Singh, it aims to serve and uplift society through the practice of core values – nishkamta, or the spirit of selflessness, being one of them. Inspired by Dharam (religion) GNNSJ has generated a flourishing culture of volunteering, which has contributed immensely to transforming visionary projects into reality. For his services to religious faith propagation, community service, education and research, Bhai Sahib has been awarded two Honorary Doctorates from Birmingham’s Universities. Bhai Sahib Mohinder Singh was also created a knight by the Holy Father Pope Benedict XVI in recognition of his dedicated work for Roman Catholic-Sikh relations and for his enthusiastic commitment to working for peace among people of all faiths. He is passionate about values-based education and is the Patron of the Nishkam Education Trust which has set-up Nishkam Nursery (2009), Nishkam Primary Free School (2011) and Nishkam Secondary School with 6th Form (2012).